The days are getting short, the weather’s cooling down, and average first frost is only three days away. It’s still officially summer, but I’m in fall mode now. 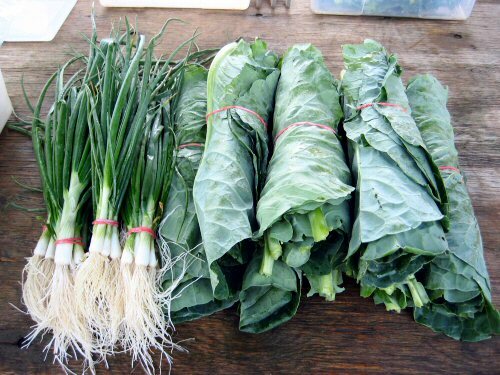 Green onions and the brassicas, like this open leaf cabbage, are hardy mainstays of the fall harvest. I was wondering what you did with the Cabbage leaf in Canada. Back here in Kerala, South India, I have some off season Cabbages. Temperature here is close to a 100 deg F. I won’t get any cabbages. May be I can eat the leaves making a soup. BTW, I am planning to migrate to Canada as a farmer. There are some Visa openings for farmers who are willing to purchase farm land in Canada and join the farming community. I would highly appreciate your valuable advise.